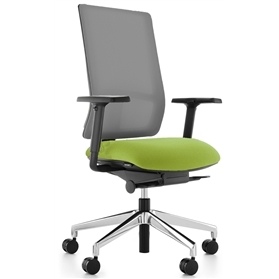 The Q task chair combines comfort, aesthetic styling and functionality. It delivers a height adjustable mesh-back which provides a flexible and breathable surface, owing to the use of 3D knit mesh technology. This ensures superb life-long support for all users. Q boasts a new breed of synchronised mechanism that gives enhanced geometry and assures the user of complete comfort throughout its range of movement. Standard Features: Seat depth adjustment 70mm Forward seat tilt of 3 degrees Recyclable Thoracic support Height adjustable mesh back 3D Black mesh back.